Tad Lucas has been called the greatest woman rider of all time. She traveled the world in the early 1900s dazzling crowds with her daring trick riding, bronc riding, and steer riding. After competing and performing for more than forty years, she was recognized by her peers for her accomplishments. She is the only woman honored by all three rodeo halls of fame: the National Rodeo Hall of Fame, the National Cowgirl Hall of Fame, and the Pro Rodeo Hall of Fame. Lucas, born Barbara Barnes, embodied the spirit of the American West. Her courage, independence, and compassion helped keep that heritage alive. In her will, she established the Tad Lucas Memorial Award to honor women who excel in any field related to Western heritage. Her spirit lives on through her daughters and the millions of girls who follow their hearts—and ride their horses—across the West. Author and educator Laura B. Edge earned a BA in education from the University of Texas at Austin. After years of teaching, she jumped into full-time writing. Edge enjoys research and uses her love of history to create books that bring the past to life. Her story of the 1909 Garment Workers strike, We Stand As One, won the Children’s Book Committee at Bank Street College Best Children’s Book of the Year award and the Pennsylvania School Librarians Association Young Adult Top Forty award. She is a member of the Society of Children’s Book Writers and Illustrators and a team leader for the Women’s Storybook Project of Texas. Like many young girls, she loved horses and dreamed of owning one. She resides in Houston, Texas. Artist and educator Stephanie Ford has always had a strong interest in art and horses. Like Tad, she hung upside down on a cantering horse on purpose! Ford competes in Western art shows across the country. Her signature scratchboard art has won awards for its depiction of the historical West, the American Civil War, and, of course, horses. Ford is a member of the International Society of Scratchboard Artists, Women Artists of the West, and Society of Children’s Book Writers and Illustrators. She lives with her husband and daughter on a small beef-cattle ranch in Texas. This was a powerful book that really explored an amazing woman and champions the spirit of girl empowerment! I loved reading this to my daughters as it truly showed them that they could be anything that they wanted to be if they put their mind to it in the end. 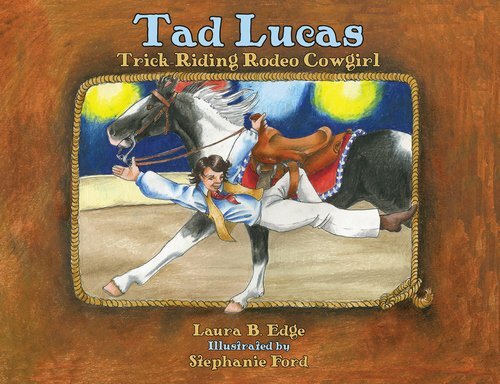 The book is filled with amazing images and you can truly appreciate all that Tad Lucas accomplished in her career and her life through this great tribute of a book!